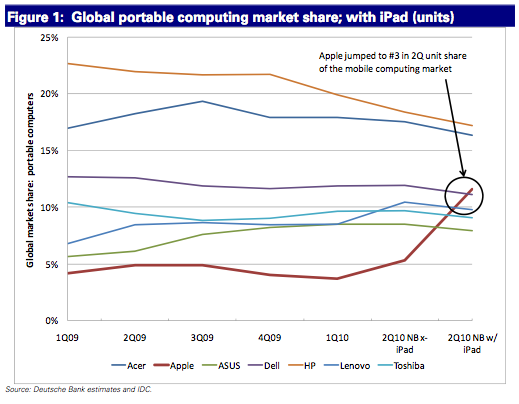 Apple's market share as a mobile PC vendor has surged along with the launch of iPad, breaking 200% year over year growth while vaulting the company from seventh to third place in global portable computing. As noted in a report by Philip Elmer-DeWitt of Fortune, Deutsche Bank analyst Chris Whitmore has issued a note to clients outlining Apple's dramatic growth in portable computing, greatly accelerated by brisk iPad sales. Even without counting iPad sales, Apple's growth in Mac notebooks has propelled it ahead of Dell, HP, Lenovo to achieve the second fastest rate of growth among mobile PC vendors behind netbook maker Acer. Adding in iPad, Apple leaps well above all rivals by a huge margin. In terms of actual unit sales, Apple's market share in portable PCs jumped in the second quarter of 2010 from just over 5 percent (when only counting Macs) to more than 12 percent of the global market for mobile PCs, outpacing ASUS, Toshiba, Lenovo and Acer to take the third place spot behind HP and Dell in volume sales. "Our retail checks suggest this share shift continues in July," Whitmore wrote, "where the iPad is directly cannibalizing demand for other vendors' notebook products. Remarkably, Apple's traditional MacBook business posted accelerated unit growth on a Y/Y basis in 2Q despite the launch of the iPad while every other Top 5 vendor slowed." IDC, Gartner and other firms that track PC market share were quick to add tablets and then limited duty netbooks to their PC sales figures, moves that helped knock down Apple's global market share figures as millions of the low-cost mini-laptops shipped to consumers. 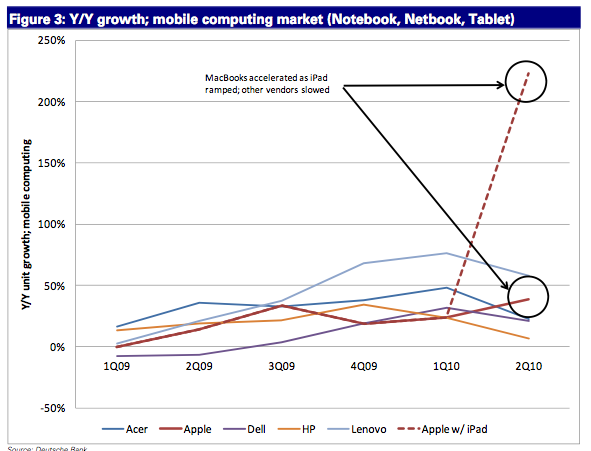 However, the firms are not yet counting iPad in their mobile PC numbers. Ballmer later expressed concern about the volume of iPads Apple had sold, while indicating that Microsoft wanted to do to tablets what it did to netbooks: push sales back into the Windows fold. Microsoft hasn't been able to garner much interest in its existing Windows-based tablet products however. Ballmer consistently refers to the next generation of tablets as "slate PCs," the term he used to promote a now canceled product with HP at the January CES event. The rebranding appeared intended to ditch the connotation of failure attached to "Tablet PCs," the company's name for the mobile tablet form factor that Microsoft's Bill Gates had pushed throughout the previous decade. Apple's iPad instantly became the product to copy after its wildly successful launch this spring. HP is now apparently seeking to brand its upcoming webOS tablet the PalmPad, while RIM is similarly borrowing Apple's product name to deliver a BlackPad. Ballmer's company similarly sought to hold onto mindshare among MP3 players earlier in the decade by calling them "Portable Media Players," while Apple vacuumed up all attention in the category with its iPod brand. Microsoft finally conceded Apple's leadership position when it relented and used the term "podcasts" within its own media playback software.